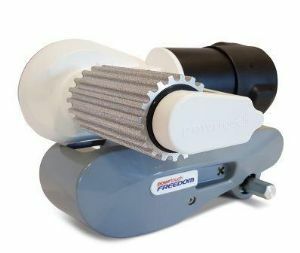 • The Original Powrtouch Freedom mover system is competitively priced, designed and manufactured to the highest standards. • Powrbar cross actuation system that allows BOTH rollers to be engaged or disengaged from EITHER side of the caravan. • Designed for maximum ground clearance. • Fluid movement control giving the ability to change direction without stopping. • Full soft start system giving MILLIMETRE by MILLIMETRE control. • Full DIY instructions available. • Low battery indication system (for both the handset and caravan battery). • Automatic shutdown after 20 minutes to prevent accidental battery drain if the Powrtouch is left switched on. should you encounter any issue with performance of your mover. At home or on holiday, Powrtouch remain the brand you can truly rely on.